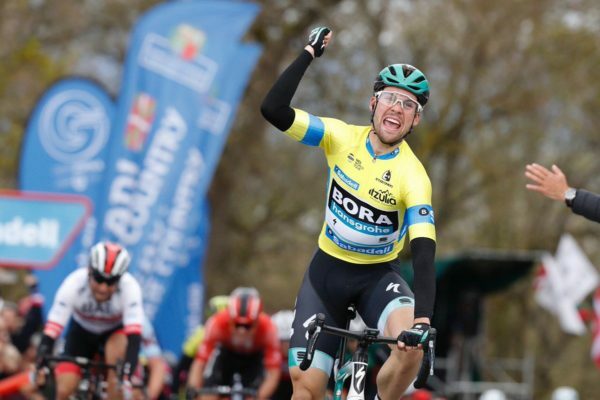 The man of the moment may be riding for Bora-hansgrohe, but Dan Martin is loitering with intent and he now has a fantastic chance to convert his position into a very big result over the next three stages. Above; race leader Schachmann takes his second win in three days in the Basque Country. He may not have gained any time on the race leader, and stage winner again; but Dan Martin is now up to 5th overall the Tour of the Basque Country. Today’s stage 3 went to Maximilian Schachmann; the Bora-hansgrohe German adding today’s win to his TT victory of Monday. And he now has a commanding lead overall as he took a 10-second win bonus today while those who were closest to him overall this morning fell down the standings. Yesterday’s winner Julian Alaphilippe (Deceuninck-QuickStep), for example, was 2nd overall this morning at just 5 seconds but lost just over 12 minutes today. Michał Kwiatkowski (Team Sky), who was 3rd this morning at 10 seconds, lost 9:28 today. The Frenchman and the Pole were both victims of a crash with 6km to go, below, on today’s stage and limped home. After the crash occurred the early escape group was caught with just 4km remaining, setting up a chariot race to the line. The final climb in Estibaliz – some 1.4km at an average of 4.2 per cent – saw Schachmann win out with the yellow jersey on his back. He took the honours from Diego Ulissi (UAE Team Emirates) and Enrico Battaglin (Katusha-Alpecin). Dan Martin was safely in the main field, placing 21st and in the same time as the winner and 40 other riders. Nicolas Roche (Team Sunweb) was also in that group but a small gap appeared towards the back of it meaning he was caught on the wrong side of a gap judged to be eight seconds. It remains to be seen whether the current race leader can hold on and take the overall. The climbing to come will definitely suit the likes of Dan Martin (UAE Team Emirates) and 2nd place overall Ion Izagirre (Astana) better than Maximilian Schachmann. But having won the TT, which featured a brutally steep climb, and also having won on an uphill finish today, he looks in fantastic form. Friday’s stage looks like it will decide matters; a cat 1 climb crested just before the finish in Arrate. However, there are also hard climbs tomorrow and on the final day on Saturday, even though those are not at, or close to, the finish. Dan Martin is now a not insignificant 49 seconds off the race lead in 5th place. But if his climbing legs play ball in coming days, he is in a great position for a big overall result.